“It’s a bigger problem than people realize,” said Paulette Rende. A Mississauga mother says she is protesting the Dufferin-Peel Catholic District School Board (DPCDSB) so her son can go to school. 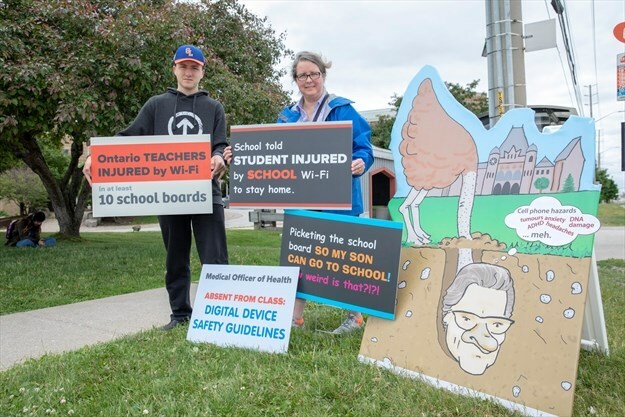 Paulette Rende’s goal is to raise awareness about electro-hypersensitivity (otherwise known as Wi-Fi injury) and the need for digital device safety in Ontario schools. “It’s a bigger problem than people realize,” said Rende. Her son Alex, 17, a student at St. Paul’s Secondary School in Mississauga, suffers from electro-hypersensitivity. She says he has a “broad spectrum of symptoms,” including: headaches, congestion, heart palpitations, anxiety and nausea. “To the detriment of students and teachers, the provincial government has been that ostrich with its head in the sand, ignoring the glaring gaps in health and safety guidelines,” said Rende in a release. According to Women’s College Hospital (WCH), electro-hypersensitivity is a condition that develops when people are exposed to non-ionizing radiation from electromagnetic fields, such as high-energy radio waves and microwaves. Rende is hoping a change in provincial government will lead to changes in school policy. She says other school boards across the province are having the same issues with Wi-Fi injury. “I’m here (protesting) at a local level,” Rende adds. “We understand and are sensitive to the safety concerns some community members have regarding the use of wireless technology (Wi-Fi) in schools,” Bruce Campbell, the school board’s manager of communications and community relations, said in an email. The board began Wi-Fi installations in late 2012, and since then have conducted yearly tests to measure radio frequencies using Health Canada’s Safety Code 6 standard, as a guide, said Campbell. Currently, he said, tests indicate that the board’s schools are measuring significantly less than one per cent of the minimum standard defined by Health Canada. This is 99.99 per cent safer than Health Canada’s defined minimum standard. Campbell said the board will “continue to rely on the expertise and standards of organizations like Health Canada, Peel Public Health and Wellington-Dufferin-Guelph Health to guide our use of technology, from a health perspective, in our schools. “We are well aware of the specific concerns of this parent and have offered and/or provided numerous accommodations to try to meet the needs of the family,” Campbell said. This entry was posted on June 14, 2018, 4:57 pm and is filed under c4st, Children, Dufferin Peel Catholic Separate School Board, government, Media, Mississauga, Newspaper, Ontario, school, wifi. You can follow any responses to this entry through RSS 2.0. You can leave a response, or trackback from your own site.